For other uses, see Jeep Renegade (disambiguation). The Jeep Renegade (BU/520) is a subcompact crossover SUV (mini SUV in Europe) produced by Jeep. The off-road vehicle was first shown to the public in March 2014 at the Geneva Motor Show and production started in late August of that year. Standard Renegade models come with front-wheel drive. The vehicle offers the four-wheel drive systems Active Drive I and Active Drive Low, both of which are paired with Jeep's Selec-Terrain System. At one time it was believed that the Renegade would replace the Jeep Compass and Jeep Patriot in the Jeep lineup. The Patriot was discontinued after model year 2017, but the second generation Compass was launched in early 2017. The Renegade is the first Jeep product to be produced exclusively outside of North America and is sold on the North American, European, Brazilian, South African, Australian, and Chinese markets. The vehicle is built in Melfi, Italy (alongside the related Fiat 500X); Goiana, Brazil (alongside Jeep Compass and Fiat Toro); and in Guangzhou, China. Standard Renegade models come with front-wheel drive, with four-wheel drive available on Sport, Latitude and Limited trims. In the US, the lineup consists of Sport, Latitude and Limited trims, all of which come with a choice of front- and four-wheel drive, as well as the Trailhawk trim, which is 4WD only. The Renegade has an available My Sky dual panel removable roof. The My Sky can be either retracted like a standard sunroof or removed completely for a more open-air experience, similar to that of the Jeep Wrangler. The base Sport model includes a 1.4L MultiAir Turbocharged Inline Four-Cylinder (I4) engine or a 2.4L multiair inline 4 engine, a six-speed manual transmission or 9 speed automatic transmission, sixteen-inch, black-finished steel wheels, a black-finished front grille, black side mirrors and door handles, the Uconnect 3.0 A/M-F/M stereo w/ USB, iPod, and 3.5-millimeter auxiliary audio input jacks and four speakers, a heater, dual air conditioning, cloth seating surfaces, a 3.5-inch monochromatic instrument cluster display screen, remote keyless entry with power door locks, and more. The Power and Air Group adds air conditioning and power windows. The Sound Group adds the Uconnect 5.0BT A/M-F/M stereo with USB, iPod, and 3.5-millimeter auxiliary audio input jacks with five-inch color touch-screen display, voice command, Uconnect hands-free Bluetooth phone and stereo wireless audio streaming, and six speakers. The Sport model's MSRP, without options, for front-wheel drive (FWD) is $17,995.00, and for four-wheel drive (4X4/4WD), is $19,995.00. The mid-level Latitude model includes the Sport's standard equipment, plus seventeen-inch black-accented alloy wheels, exterior-colored side mirrors and door handles, the Uconnect 5.0BT A/M-F/M stereo w/ USB, iPod, and 3.5-millimeter auxiliary audio input jacks with five-inch color touch-screen display, voice command, Uconnect hands-free Bluetooth phone and stereo wireless audio streaming and six speakers, power windows, air conditioning, and more. The MySky removable "sunroof" roof panels, both manually-removable or power-retractable, are available on this model and higher-end models. The Latitude' model's MSRP, without options, for front-wheel drive (FWD) is $21,295.00, and for four-wheel drive (4X4/4WD) is $23,295.00. In Europe, this is called Longitude. The top-of-the-line Limited model includes the Latitude's standard equipment, plus the 2.4L TigerShark Inline Four-Cylinder (I4) engine, a nine-speed automatic transmission, leather seating surfaces, a silver-finished front grille, chrome side mirrors and door handles, and more. The MySky removable "sunroof" panels, both manually-removable or power-retractable, are available on this model, the Latitude model, and higher-end models. The Limited model's MSRP, without options, for front-wheel drive (FWD) is $24,795.00, and for four-wheel drive (4X4/4WD) is $26,795.00. The off road-ready Trailhawk model includes the Latitude's standard equipment, plus the 2.4L TigerShark Inline Four-Cylinder (I4) engine (2.0L Multijet II only for Europe), a nine-speed automatic transmission, red-finished front tow hooks, off-road suspension with underbody skid plates, a rugged interior, and more. The MySky removable "sunroof" panels, both manually-removable or power-retractable, are available on this model, the Latitude model, and higher-end models. The Trailhawk model's base MSRP, only available in four-wheel drive (4X4/4WD), is $25,995.00. TrailHawk models are "Trail Rated" and feature Jeep's Active Drive Low four-wheel drive system and a 20 mm (0.79 in) lift kit. It also features 17 in (430 mm) aluminum wheels, skid plates, and unique front and rear fascias compared to standard Renegade models. Like the Jeep Cherokee Trailhawk, the Renegade Trailhawk features red front and rear tow hooks, a red 'Trail Rated 4X4' badge on both front upper fenders, a black vinyl decal in the center of the hood, and alloy wheels with black-painted accents. The Trailhawk model emphasizes the Renegade's off-road capabilities, and is meant for the avid off-roader. All models other than the base Sport model offer optional features such as passive entry with push-button start, a remote start system, the Uconnect 6.5AN stereo with A/M-F/M HD Radio, iPod/USB and 3.5-millimeter auxiliary audio input jacks, SIRIUS-XM Satellite Radio, voice command, Uconnect ACCESS and Apps with hands-free Bluetooth phone and stereo wireless audio streaming, GPS navigation by Garmin, a 6.5-inch touch-screen display, and steering wheel-mounted remote controls, nine premium amplified speakers with a subwoofer, SIRIUS-XM Satellite Radio, power front bucket seats, the MySky retractable roof panel system (manually-removable or power-retractable), heated dual front bucket seats, and more. 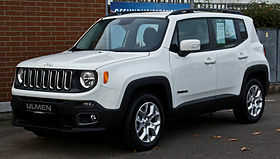 All Renegade models are powered by 3 or 4-cylinder engines, sourced both from Fiat and Chrysler depending on market. The Renegade offers either cloth or leather seating surfaces. It offers seating for five passengers, with a 40/20/40 split-folding rear bench seat, and a fold-flat front passenger's seat for more cargo capacity. In North America, it offers a standard Uconnect 5.0BT radio with an AM/FM radio, Sirius XM satellite radio, voice command, a Microsoft-derived touch screen interface, and iPod and USB inputs, as well as a 3.5-millimeter auxiliary audio input jack. Uconnect Phone will also be standard. A rearview backup camera will be optional. The optional radio will be the UConnect 6.0 radio, offering all the features of the UConnect 5.0BT radio, while adding a touch screen interface designed by BlackBerry (a smaller version of the UConnect 8.4A and 8.4AN radios), and navigation system capabilities by Garmin. In June 2018 the Renegade has been updated with some slight aesthetic touches: the front and rear bumpers have been redesigned, new LED headlamps (the same ones used for the Wrangler) were adopted, and the front grille is larger. The infotainment system was upgraded with a new, more up-to-date processor and a more generous display that varies from 7" up to 8.4" in the navigator version. The displays are all multitouch and the customizable menus also offering the possibility to adjust the air conditioning. Android Auto and Apple CarPlay compatibility was introduced. The Longitude version now also has USB jack on the back of the armrest dedicated to passengers sitting in the rear seats. The European version introduced the new gasoline engines of the Global Small Engine (FireFly) family produced by FCA Poland Powertrain in Biesko Biala in two versions: 1.0 L Turbo 3-cylinder 120 hp with direct injection, Multiair system and GPF filter, and 1.3 L Turbo Multiair with direct injection and GPF filter 110 kW (148 hp; 150 PS) and 132 kW (177 hp; 179 PS). The 1.0 L is available with a 5-speed manual transmission and front-wheel drive, the 1.3 L with a 6-speed manual transmission, a 6-speed automatic double clutch or a 9-speed ZF automatic with front or 4-wheel drive. The diesel engines introduced the SCR system and are approved Euro6D-Temp. In September 2018 the facelifted Renagade was unveiled for the North American market (MY2019) which introduced the 1.3 L GSE Turbo Multiair engine with 132 kW (177 hp; 179 PS) as a replacement for the 1.4 L Fire Turbo Multiair, while the 2.4 L Tigershark engine remains available. The North American model has the same changes applied to the European model. In October 2018, the updated version for the South American market produced by FCA of Gioiama (Pernambuco) in Brazil was introduced and presents only aesthetic updates with the adoption for all versions of the Trialhawk bumpers; the front and rear headlamps remain those of the previous model. The engines for the South American market are the 1.8 L E.Torq Evo gasoline and the 2.0 L Multijet diesel. ^ a b c d Clark, Jennifer. "Jeep to unveil Italy-built Renegade subcompact SUV". Automotive News. Crain Communications Inc. Retrieved 3 March 2014. ^ a b "FCA Group - The Plant". www.fcagroup.com. Retrieved 2016-04-17. ^ "First Chinese-Built Jeep Renegade Rolls Off Production Line". Carscoops.com. 19 April 2016. Retrieved 20 April 2016. ^ "10 Things You Need to Know About the 2015 Jeep Renegade". Car and Driver. 7 March 2014. Retrieved 22 June 2014. ^ Eisenstein, Paul (4 March 2014). "Small is Big as Jeep Unveils New Renegade". The Detroit Bureau. Retrieved 4 March 2014. ^ "FCA US Media - Jeep® Renegade Trailhawk and Limited Debut at the 2016 Beijing Auto Show". media.fcanorthamerica.com. ^ Ramsey, Jonathon. "We wish the Fiat Toro compact pickup would come to America". Autoblog. Retrieved 2016-04-17. ^ Undercoffler, David (4 March 2014). "Geneva Motor Show: Jeep debuts all-new Renegade crossover SUV". Los Angeles Times. Retrieved 4 March 2014. ^ "2015 Jeep Renegade". 19 April 2014. Retrieved 19 April 2014. ^ "PT Garansindo Inter Global to launched New Jeep Renegade in Indonesia". 17 September 2014. Retrieved 17 September 2014. ^ a b "All-new Jeep Renegade Makes its Latin American Debut at the 2014 Sao Paulo Motor Show". FCA US LLC. 29 October 2014. ^ "New 2019 Jeep Renegade". www.jeeppress-europe.com. Retrieved 26 December 2018. ^ "FCA PRESS". www.fcapress.com.br. Retrieved 26 December 2018. ^ a b "Jeep Brand Records Fourth Consecutive Global Sales Record" (Press release). Fiat Chrysler Automobiles N.V. 5 January 2016. Retrieved 5 January 2016. ^ a b c "Sales of Fiat-Jeep in Brazil". carsitaly.net. Retrieved 29 June 2017. ^ "(Sales United Kingdom)". Cars Italy. Retrieved 2017-07-07. ^ a b "FCA US Media - FCA US Reports 2018 December and Full-Year Sales". media.fcanorthamerica.com. Retrieved 31 January 2019. ^ "FCA Northamerica(Canada-July-17-Sales)". FCA Northamerica. 2017-08-01. Retrieved 2017-09-07. ^ "(Sales China)". Cars Italy. Retrieved 2017-07-07. ^ "(Sales Argentina)". Cars Italy. Retrieved 2017-07-07. ^ "FCA México reporta ventas de 8,493 unidades - Vision Automotriz". www.visionautomotriz.com.mx. ^ "Sales of Fiat-Jeep in Russia - Vendite di auto FCA in Russia". www.carsitaly.net. ^ "Sales of Fiat-Alfa Romeo-Jeep in Australia - Vendite di auto FCA in Australia". www.carsitaly.net. ^ "Sales of Fiat-Lancia-Alfa Romeo in Turkey - Vendite di auto FCA in Turchia". www.carsitaly.net. ^ "Cars Italy (Fiat Sales 2018)". Retrieved 31 January 2019. ^ "Sales of Fiat-Jeep in China - Vendite di auto FCA in Cina". www.carsitaly.net. Retrieved 31 January 2019. ^ "Sales of Fiat-Chrysler in Mexico - Vendite di auto FCA in Messico". www.carsitaly.net. Retrieved 31 January 2019. Wikimedia Commons has media related to Jeep Renegade.